Winter is hard on roofing, with its bitter winds and heavy snows. As a result, many homeowners experience problems with their roof during this season. But is roof replacement in cold, wet, snowy winter weather a realistic possibility? Roof repair can be completed in cold, dry weather, but the quality of the finished product may be adversely affected by wet, snowy shingles. Many roofing shingle manufacturers stipulate the temperatures at which their materials can be installed – usually 26 degrees Fahrenheit or above. Adhesives must be chosen and applied carefully to avoid freezing during flat roof membrane installation. When installing composition shingles, roofers need to be careful not to damage the shingles when nailing them into the roof. Shingle makers do not change their warranties based strictly on installation temperature. This means that your new 30-year dimensional shingle has the exact same warranty as a roof installed at any other time of the year. New shingles need to undergo thermal sealing, which can take several days of temperatures of 40 degrees Fahrenheit or higher. All steep slope roofers must be careful not to damage the underlayment, which can become brittle in cold weather. Only 30-pound felt (or better) should be considered as underlayment, and all underlayments should be installed using cap nails and not staples. For complete re-roofing jobs, make sure to ask your roofer not to remove more roofing than can be replaced on the same day. Northern winters test your home and roof in ways unlike any other time of year. The most common winter roof problem is ice dams. Ice dams occur when snow that has accumulated on a slanted roof melts and then forms icicles that hang from the eaves and gutters. Professional roofers can help you with drip-edge flashing techniques to prevent ice dams. Improper amounts of attic insulation can also cause ice dams. Speak to your roofer about the various options for preventing ice dams. Old roofs hate cold winters. As winter temperatures fluctuate, your shingles expand and contract, causing curling and cracking in older shingles. Then the weight of the snow causes some of those curled shingles to crack, which could lead to a leaky roof. 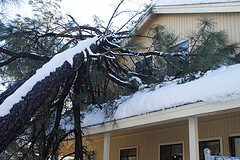 Also, when the roof is already wet, heavy snow freezes can cause even more damage. Sometimes a roof is in such poor condition that the homeowner can't wait until spring to repair it. If you consult an experienced roofing contractor and decide winter roof replacement is necessary, your roofer will watch the weather and schedule your roof installation when the forecast is mild. Roofing contractors are less busy in the winter than in the summer. What this means for homeowners is that the roof contractor you choose might be able to install your new roof in a matter of days as opposed to weeks or even months in the warm season. For many homeowners, quick timing is reason enough to have a job done in the winter. Many roofing companies offer winter discounts for roofing repairs and re-roofing jobs during the winter. For the same reasons that you might receive faster service on a new roof during the winter, you may also receive a better price than in summer. According to Sandy Feltner of Roof Time, their estimators are instructed to discount a winter installation by as much as 25 percent over the same type of spring job. Roofing contractors want to keep their crews busy and can offer deep discounts to avoid lay-offs. By March, roofers begin to fill up their job boards, so their goal over the winter is to hang on to their skilled labor force. Most professional roof installers will provide you with the same labor warranty for a roof installed during winter as a roof installed any other time of year. For example, Roof Time offers a long-term labor warranty in conjunction with the Midwest Roofing Contractors Association guidelines, without regard to the time of the installation. Written by Dale Shoemaker of Roof Time LLC.